Does the idea of getting married by the beach at sunset with your closest friends and family sound like a great idea? It’s so much more intimate, less stressful and cost a lot less than a traditional wedding. If this sounds like you, keep on reading for some elopement ideas and inspiration. This elopement styled shoot took place at the Jean Klock Park in Benton Harbor, Michigan and was beautifully styled and planned by Deanna Williamson. 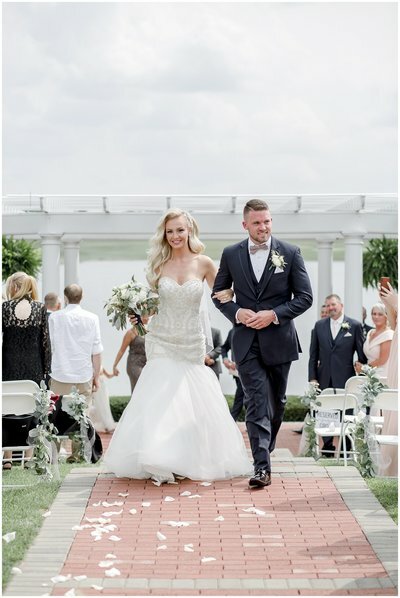 The theme of this elopement was a dusty blue beach wedding with real seashells for decor, cotton paper stationery and a romantic tablescape for the bride and groom. Tip: if you’re going to have a beach wedding, aim to do it at sunset as there will be less people at the beach during that time and the weather will be cooler. Keep in mind that it will be quite windy if your ceremony is right by the water so consider doing it further back. Tip: bring a vase so that you can place your bouquet into the vase as table decor. We used real plates and silverware for this photo shoot but you can get some real nice plastic dinnerware that will look just as elegant. Peach and white florals were used to complement the dusty blue colors. Decorative pillows were also used for a more intimate setting. Deckled edged cotton paper will always by my favorite type of wedding stationery. This cake is quite simple yet beautiful and was made by With Love Cupcakes and Cakes. You can add silk or real flowers to dress it up or leave it as is. 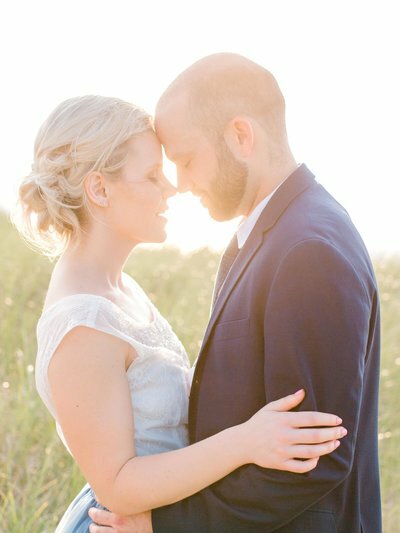 Rather than wear all white for your elopement, you can chose to wear your favorite colors and be comfortable in it. Amazon sells some real nice skirts and it comes in various colors (I own several of these skirts in my collection for myself!). I love doing wedding portraits at sunset… there’s just something so magical and romantic about it. 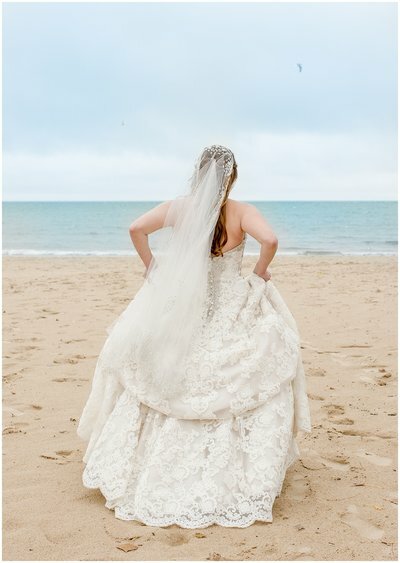 I had so much fun photographing this styled shoot and would love to photograph more beach elopements by Lake Michigan.  If you’re thinking of doing an elopement, check out our elopement packages.